“I actually think I am figuring this out,” I announced to Violet two days after the all-blue incident. “The first day he was in white and bought an old copy of Pride and Prejudice with a white cover. The next visit he bought a rare edition of Alice in Wonderland in a blue cover, wearing blue, driving a blue Prius. “And this helps us figure this out, how?” Asked the impertinent Violet. “Ok, maybe it doesn’t. I have lived in Vegas for over 20 years. I have seen a lot of stuff. A. LOT. OF. STUFF! But this …” my voice trailed off as my mind wandered to the sight currently entering my little shop. Today he was a vision in lime. Yes, lime. Head to toe and, because I simply could not help myself, I went to the door as he made his way directly to the rare books section. Yup, you guessed it, there sat a lime green Scion. An older one that was in mint condition. I turned and looked at Violet and we shared one of those “What in the world?” facial exchanges. I consider myself a bit of a sleuth. Mysteries are my genre of choice. Time to put some feet to my crazy thoughts. “May I help you find something in particular, sir?” I asked the lime-green-clad-candy-apple-hair gentleman as he lifted a copy of Sherlock Holmes from the shelf and held it open shuffling the pages downward. “No, thank you, ma’am.” He answered politely. “No, I simply cannot bear loose pages. The binding must be perfect.” He answered without looking at me. “I see. I do love a perfect rare book myself. Obviously,” I said gesturing to my lovely collection. “I assumed as much,” was all the monotone response I received. I guess I was secretly hoping for a compliment on my shop. Dressed in white. White Chevy. Jane Austen. Pride and Prejudice. White cover. Dressed in blue. Blue Prius. Lewis Carroll. Alice in Wonderland. Blue cover. Dressed in lime. Lime Scion. A. Conan Doyle. 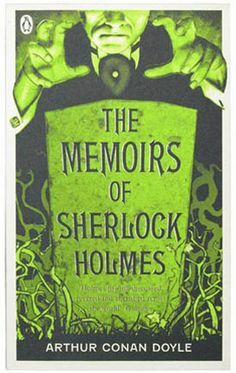 The Memoirs of Sherlock Holmes. Lime-ish cover. Yes, he had not purchased that book yet, but please anyone could see that is the logical choice. Of all the rare books on my shelves, how many have a lime cover? The answer is: not many. Now to figure out what kind of show he has, or produces, or is planning, or … I am running out of or’s. Is it on The Strip or on Fremont Street or … Ok, I’m seriously done. I need some answers. Well, I guess I don’t “need” them. I WANT them. This entry was posted in Blogging, characters, Writing and tagged blogging, fictional characters, paddlecreekwriters, prompts by PaddleCreekWriters. Bookmark the permalink. Ohhhhhh, I like it! Lime green. What on earth could be coming next? Yup, stay tuned. Good job, Pat.